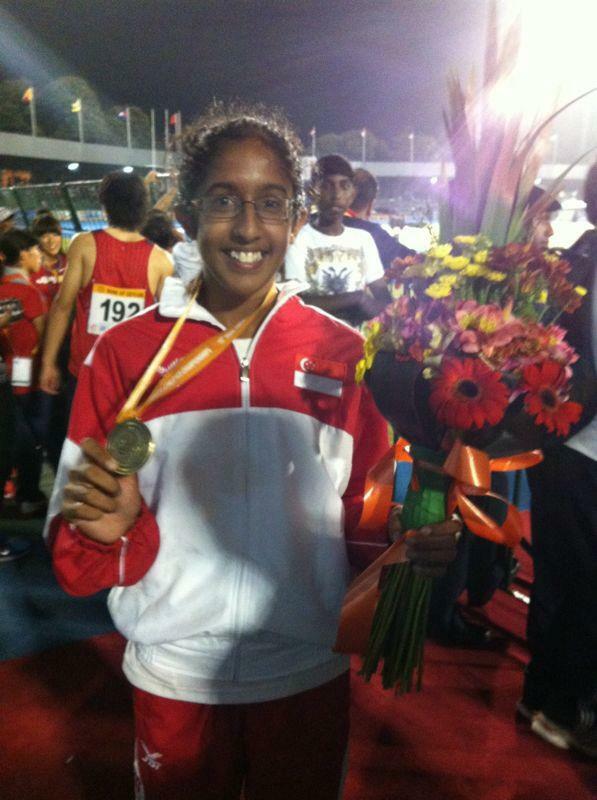 Shanti Veronica Pereira posing with her well earned Asian Junior Championships bronze medal for the 200m women event. She crossed the line in a time of 25.09 seconds. Photo courtesy of Asmah Hanim. It was on the final day of the Asian Junior Championships that the Republic ended its wait for its second medal. Sprinter Shanti Veronica Pereira will be standing on the podium for her bronze as she clocked 25.09 seconds in the women 200m final. Although slower than her qualifying round timing of 24.93 seconds (0.0m/s), she had to battle strong headwind which was recorded at -3.1m/s. The 16-year showed promise at a youth level, and is still good for another 3 more years to be eligible to compete at future junior meets. She is coached by Margaret Oh, and is a success story of Singapore Sports School world-class student-athlete program.